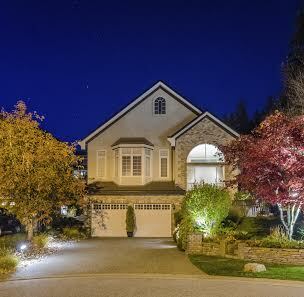 Along with practicing routine maintenance, implementing outdoor lighting increases the curb appeal of your home. Homeowners aim to increase their curb appeal for various reasons. Perhaps you want to send a message to your neighboring community that you take pride in your property. If you are selling your home, maybe you want to spruce things up visually to draw in more potential buyers. Whatever your reasons are for wanting to increase your curb appeal, it will have positive effects on your property and be aesthetically pleasing for passersby. So, how do you do it? Routine maintenance is a key factor. You have lots of landscaping options when trying to increase curb appeal. Trees and shrubs add color and life to your property, while sometimes increasing privacy and security. Incorporating plants and flowers is a simple way to improve the overall appearance of your property. If you have landscaping, you should keep it well maintained. Make sure your grass is well kept and trimmed (while removing out tough weeds). Consider leaf removal if you have an uncontrollable pile in your yard. If you’re looking for an easy way to increase your home’s curb appeal – clean up! Cleaning up doesn’t end with taking out the trash. Powerwash exterior doors, shutters and windows so they are not plagued by dirt or animal droppings. Sweep your walkways, driveways and front porch area – clearing any dead plants or old newspapers that have accumulated. If inclement weather strikes, be sure to shovel snow out of walkways and driveways for easy access by foot or vehicle. Outdoor lighting can be used to accentuate and highlight specific features of your landscape construction – like walkways, doorways or sculptures. It can be implemented subtly to provide increased safety and security for your home. Potential buyers are especially interested in features that increase security – if your home is well lit, it is less likely to fall victim to a potential intruder. Need Help With Maintenance? Contact Atlantic Maintenance Group Today! Do you need help increasing your home’s curb appeal? Look no further! Expert advice, installation, and care is a key factor in maintaining the integrity of your property year-round. Atlantic Maintenance offers quality landscape, asphalt, and concrete maintenance services. We have the expertise to help meet all of your needs. This entry was posted on Friday, January 15th, 2016	at 9:54 pm	and is filed under Blog, Curb Appeal	. You can follow any responses to this entry through the RSS 2.0	feed. Both comments and pings are currently closed.